A new survey, carried out by the online magazine Money sense, mentions that Oakville, located in Ontario, is the best city in Canada for immigrants for the present year. This puts Oakville ahead of Toronto, which is popular and regarded as a great destination for newcomers to Canada. Toronto obtained the fifth rank in the Best Places to Live for New Canadians. 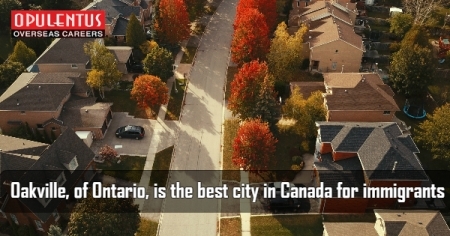 Oakville is also the best Canadian city overall and presently has a population of 200,000. It is located on the shores of Lake Ontario 40 kilometers southwest of Toronto. Moreover, it has a reputation for wealthy residents and there is a large presence of mega-mansions. It has an access to affordable housing and has a small-town sense in community matters. Money Sense gave ranks to 415 cities in Canada. This is based on the scores obtained in ten categories like Wealth, affordability, economy, population growth, commute, taxes, access to health care, crime, weather, amenities, as well as culture. The survey also enlists the qualities for a livable city. It needs to be prosperous, easy to get around, affordable, safe, and have a weather which attracts a person to go outdoors. The ranks of best places for New Canadians are based on the same categories, but the weightings are adjusted to reflect the requirements and interests of immigrants. Furthermore, there are more points to cities, which have a large population that speaks languages besides English and French. The survey increases the importance of low unemployment rate, easy access to airport and affordable rents. As per The survey the percentage of visible minorities in Oakville had an increase from 18 percent to 31 percent during the last 10 years. Around 30 percent residents speak a language other than English/French.